VERNON — Don't let Christopher Clark's polished look - his suit and tie, neatly groomed appearance - fool you. Life hasn't always been easy for Vernon's new town administrator. The 40-year-old father of three had to work three jobs to put himself through his college master's program, and, at age 16, when he developed asthma and the family had no medical insurance, had to work to pay for his own prescription so he could breathe. "I know people see a polished image, but I like to think of myself as a bootstraps person," he said. Clark was born in Brockton, Mass., a blue-collar city, then moved with his family to Easton, an affluent community, but Clark said he and his five siblings were the "poorer" kids on the block. Vernon's new town administrator. Flanked by town papers and financial spreadsheets, new Town Administrator Christopher Clark hit the ground running at his new job. A New England native, Clark began in Vernon on June 19, learning the ropes from outgoing Town Administrator, Larry Shaffer. Clark's first day on his own was July 3. Even with a desk filled with town papers, he still has found space to keep his kids near and dear to his heart - the F-16 mug next to his nameplate was given to him for Father's Day by his daughter Morgan, 10. — His father was a blue-collar worker, and from the age of 12 to his early 20s, Clark worked in the family business. The family business was music system installation, such as the music one would listen to at the supermarket, although Clark noted he never had a say in what music was played. His parents always wanted their six children to obtain more in life in terms of an education than they did - they wanted all six to go to college, and all six went to college. Clark obtained his undergraduate Bachelor of Science degree in Political Science from Bridgewater State College in Massachusetts in 1988. "I took a course in public administration in my senior year and thought this might be something I'd like to do," he said. After graduation, Clark moved on to obtain his Master's Degree in Public Administration, or MPA, in 1990 from Suffolk University in Boston. "It was one of two schools in Massachusetts at the time with an accredited program. I think there are more now," Clark said. Being one of six children, Clark worked three jobs to support himself through his Master's program. "I paid my way through Suffolk," he said. "I worked three jobs - one job to pay for school, one for spending [money] and one because of family obligations. I don't think I've ever been so tired as those two years [of school]," Clark said. Upon graduating from Suffolk, Clark became the Assistant Town Coordinator in Westborough Mass from 1990-1994. Part of his duties included budget preparation - both capital and operating budgets - risk management, procurement, collective bargaining, and he even served as acting town coordinator during two transitions in the coordinator position. He then became Assistant Town Administrator in Walpole, Mass, a job he stayed at from 1994-1997. He had many of the same duties as he did in Westborough, but this job also included grant writing and administration and serving as a liaison for several committees. He worked to accomplish self-funding health insurance and the worker's compensation program, which helped increase the town's bond rating. After several years of working in Walpole, Clark received the opportunity to work with Arnold Wakelin in Wellesley, Mass. Wakelin, Clark said, was a great financial mind, and he jumped at the chance to work as his assistant director. Wakelin was 67 years old at the time he hired Clark, so Clark figured he would replace Wakelin when the time came for him to retire. They worked together for three years, until Clark's wife Stacey made an announcement: she wanted to move back to Kansas to be closer to her family. "It took nine months of convincing," Clark said. "I grew up in Massachusetts and never had the chance to be homesick." The family moved 1,500 miles to Kansas, and Clark got a job as the city administrator for the city of Tonganoxie Kansas. That job lasted one year. A year into the move, Stacey decided you can't go home again, and the family moved back to Massachusetts. Upon his return, Clark called his old boss Arnold Wakelin, who was now in his 70s. Wakelin offered Clark his old job back, but the job ended up being more than he had done the first time around. "I went back as an assistant, but I had more duties and responsibilities that Arnold [previously] had," Clark said. Wakelin had a heart attack three weeks before Clark returned from Kansas. "It was really an opportunity to step up and do more for the community," Clark said. Wakelin was diagnosed with cancer in September 2004, and died of a second heart attack on Nov. 8, 2004 - ironically, Chris's birthday. "I had to step up and fill the void - he [Wakelin] had been there 47, 48 years - it was a major void to fill," Clark said. It was Wakelin's wish for Clark to take over his position as Executive Director of Wellesley Mass., and Clark did serve in the interim from September 2004, when Wakelin passed away, until October 2005. He was encouraged by several members of Wellesley's Board of Selectmen to apply for the job, but board members changed with the elections, just a few months before a final decision was made on the executive director's position, and the board decided to "do away with the old," and ultimately chose someone else for the job - someone with no municipal financial experience. Clark was then acting as the assistant executive director, finance director and administrator, all in one. It was too much for one person to do, so Clark reached a severance agreement with the town and began looking for another job. "I was all done being an assistant," he said. "I was an assistant for 14 years -double the length of time I wanted to be - but it was good, I have no regrets." He worked briefly with a financial advising firm, but found that he had more to give on the municipal finance side. His severance package with Wellesley was for six months, which gave him the opportunity to explore other positions, other positions that ultimately lead him to apply for the Vernon town administrator's position in March 2006. Big job. 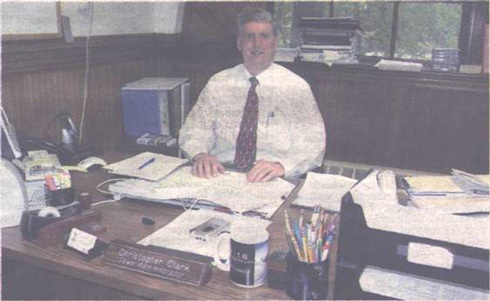 As town administrator, Clark is Vernon's Chief Financial Officer. 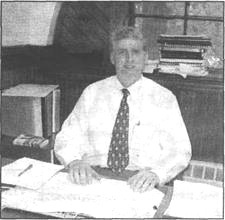 Clark worked in tandem with Shaffer prior to Shaffer's departure to take on the job as Town Manager for Amherst, Mass. "Vernon is a great opportunity," he said. "This is a hands-on job, and you really do impact people's lives directly. You pay your tax bill, and you see your services." The six months away from municipal government gave Clark a chance to spend time with his young children -Mitchell, 12, Morgan, 10, and Meadow, 2-and-a-half, and his wife, Stacey, at their home in Sturbridge, Mass. "This is a position that tends to be hard on a family," he said, noting the long hours spent at the office. Clark has been on the job since July 3, and has been busy meeting with Vernon's department heads - at their facilities - to find out how things are done. He plans to meet with the school system's interim superintendent Richard Paskiewicz to tour the schools and to talk with him and Director of Business and Finance, Arthur Poole, because Clark acknowledges there is a lot of interaction between the town and schools. Clark's goals over the next few months include getting to know more about the town and its departments, and to pick up where former town administrator Larry Shaffer left off - continuing to obtain grants, such as the grant for Central Park, which will go out to bid soon, and continue with projects such as Roosevelt Mills that Shaffer helped initiate. "It's very much a people-business, and they [town of Vernon] have a lot of department heads that care about the community - I like that," he said.